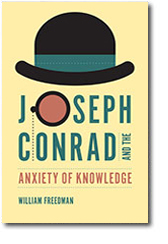 William Freedman, Joseph Conrad and the Anxiety of Knowledge. Columbia, SC: University of South Carolina Press, 2014. 176pp. If books of literary criticism can broadly be divided into two camps, those which rely on scholarship or a theoretical approach to bring something into conjunction with the text, and those which rely on sensibility and an incisiveness in reading “the words on the page” before all, then Joseph Conrad and the Anxiety of Knowledge, by William Freedman, belongs primarily in the second camp. However, Freedman is also interested in what he calls “biographical pressure,” “not the usual one of self-revelation but, more unusually, the self-revelation all but inevitably entailed in the effort to avoid or conceal it.” So his book looks squarely and in detail at major novels, but also looks beyond them at the “figure behind the veil,” as Conrad puts it in A Personal Record, a figure, in Freedman’s view, who maintains one prime strategy for remaining there. The shortest and least compelling chapter that Freedman provides in his unrelenting account of Conrad’s narrative strategies for evading unpalatable knowledge is that on Under Western Eyes. Consistently, Freedman is interested in the narrator: “Conrad’s decision to add this narrator to his original story of Razumov performs, in a far more sweeping and inclusive manner, the function of Marlow’s obscuring mystifications, evasions and retreats in Heart of Darkness and Lord Jim. The strobe-light quality of flashing recognition and retraction of those novels is replaced here by a pervasive dimming, if not utter darkening, of the hall.” In accounting for the “dimming” effect of the teacher of languages, Freedman makes quite some use of Bernard Meyer and his psychoanalytic approach, the effect of which can be seen in the attention given to Conrad’s “anguished engagements with the rats and roaches swarming in his personal and historical basement.” When the discussion becomes more historical, it is difficult to distinguish Freedman on Russia from Conrad on Russia, with “ferocity,” “imbecilic” and “atrocious” among the epithets, and Russia “the cruel predator that had carved, swallowed, and devoured Poland like a slaughtered lamb.” And in this knowledgeable and scholarly book it is surprising to find Councillor Mikulin making an unwelcome appearance as “Inspector Mikunin.” However, Freedman, if uncharacteristically negligent here, is never negligible: he writes that the final violence administered to Razumov is less mystifying “if recognised as the author’s visceral revenge upon a character who has dared what he would not” (that is, facing the consequence of confessing the truth), which at first I dismissed as extravagant, and on reconsideration found troublingly plausible. Freedman finds again some of his strongest ground in his discussion of that strangely vaporous tale of dissolving certainties, The Rescue, a novel in which there has been some recent renewal of interest, and of which Paul Wiley rightly said over fifty years ago that, if not Conrad’s most popular novel, it is “the most representative.” For Freedman, The Rescue is Conrad’s most extreme case of avoidance, one in which he “all but fled the waters altogether – and that for twenty years.” Dismissing other critics’ accounts of Conrad’s paralysis in the writing of the novel, he suggests that this condition is something in the very material of the novel itself, and that Edith Travers is the character who invades and overwhelms Conrad more than any other secret sharer. Freedman is persuasive on Conrad’s identification with the “disarmed” Lingard, who abandons his brig to his passion for Mrs Travers just as, taking seriously the pun of the brig as his “craft,” Conrad comparably abandons his enterprise. But the subtlety of the chapter lies in Freedman’s discussion of Conrad’s equal identification with Edith Travers: “As Conrad’s perfect listener, who views … a story that draws her so richly and utterly inside it that its characters belong to her life and impose themselves upon her senses,” she also “shares with her creator a paralyzing vision of the infinite and eternal darkness that empties life and action of all meaning.” Thus she emerges from this account as far more interesting than Lingard, and a compelling figure to close Freedman’s excursus into the realm of dangerously intriguing womanhood. I have two quarrels with Freedman’s impressive book. The first is that it sounds the single note of its thesis a little too insistently and frequently. All readings are brought back to the protective need not to know, and the necessity not to pass on what you do know. However, this clarity, and the firm assertion of a meaning to the obscurity of much of Conrad’s writing, is part of the book’s interpretative strength and its force as a definite intervention in the direction of Conrad studies. The second is that Freedman does not take on directly whether Conrad’s avoidance of the truth compromises the value of his works to the reader. Insofar as they represent dramatizations of psychological terrors familiar to all of us, their portrayal of obfuscation is highly illuminating; as methods of avoidance of “the sustained reflection that brings some fearful revelation roaring from its cave,” we are left uneasily with the feeling that they are lesser works than they might have been.